Their gentle nature and genetic tendency to "faint" make myotonic goats a novel heritage breed. Fainting goats don't actually faint. Rather, the heritage breed has a genetic disorder which causes muscle contractions when the animal is startled. These can be serious enough to cause the goat to stiffen up and fall over, as if in a faint. A pile of baby large black hogs snoozes on straw at Widdershins Farm. The heritage breed does well in Maine, thriving on marginal pasture land. Devon cattle have been around for hundreds of years and were bred for meat production, milk production and for use as draft animals. They may not be as large or produce as much meat, milk or eggs as quickly as their mainstream counterparts, but for those farmers and homesteaders who love them, heritage breeds fill a unique niche in Maine. While not a scientific definition, when it comes to livestock “heritage breeds” are considered to be cattle, goats, swine, horses, rabbits or poultry that have remained a pure breed with deep, historical ties. According to The Livestock Conservancy, these are animals that were bred over time to develop traits making them suited to specific, local environments in addition to being more disease-resistant than more modern breeds. New, commercial varieties of livestock and poultry have been selectively bred by humans to do one thing, and one thing only, really well — whether it’s a beef breed that puts on weight quickly so it’s ready for sale at a young age or a chicken that can lay an egg a day all year long. However, as a result of being kept in commercial settings and being bred for one sole purpose, many of these commercial breeds have lost their ability to mother their young, have a lower tolerance for disease and can’t thrive in very hot or very cold climates. Because of their hardy genetic stock, heritage breeds, on the other hand, tend to have healthier immune systems. The Russells have 48 of the sturdy beef cows which Chris Russell calls triple threats. The Devons — which originated in Devonshire, England — were among the first livestock arriving with Europeans to what is now New England in the early 1600s. They became well established in and by the 1700s had spread south to what is now Florida. They animals also headed west as the draft animal of choice on the Oregon Trail in the 1830s. The Devons almost became extinct outside of New England by the 1950s where it does well on marginal pasture land and rugged terrain. Today the Livestock Conservancy lists the Devons as “recovering” thanks to renewed interest in breeding the cattle. The farm’s 200 large black hogs also date back to a breed developed generations ago in Devonshire, where they were prized for their large size and ability to thrive and forage for themselves in woods and pastures. Like so many heritage breeds, the hogs were displaced when farmers shifted to intense productions of indoor breeds in the early 1950s and the large blacks came close to extinction and remains one of the rarest British pig breeds. The Russells direct sell their beef and pork locally, Chris Russell said. 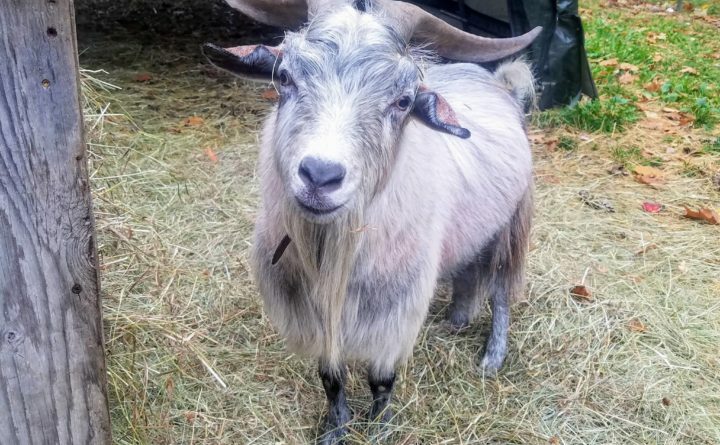 When it comes to niche marketing with heritage breeds, Sonia Antunes of Falling Goat Farm in Belmont, may have among the more unique in Maine. As the name of her farm implies, on falling goat, Antunes raises myotonic — or fainting — goats. Also known as “leg,” “stiff,” “nervous” and “scare” goats, all of which refer to the breed’s genetic condition causing prolonged muscle contraction when the animal is startled. The stiffness associated with the contractions can cause the goat to fall down, or “faint,” though it is a muscular and not a nervous system phenomena. Antunes said she got into the breed when she first got goats after doing a lot of breed research. The breed dates back to the late 1880s when a farmer from Nova Scotia introduced the goat to the American south. They became popular both for meat production and the novelty of fainting. And, according to Antunes, for a somewhat less savery purpose. 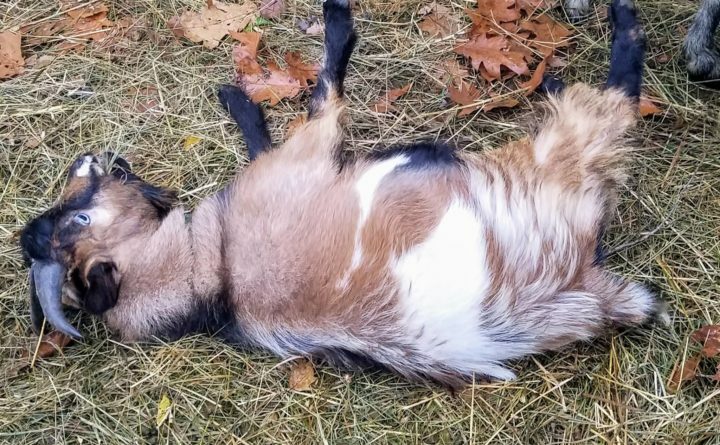 There is no official tracking of fainting goats in Maine, but the animals do well in the state, Atunes said, and as far as she knows, she is one of only three breeders in the state. Thanks to their gentle disposition, the fainters can make great pets and produce enough milk to make cheese. Kilgore said there are no numbers on how many Maine farmers are breeding and raising heritage breeds, but she did say the animals are a definite presence on the state’s livestock landscape. Chris Russell, for one, admires the animals’ staying power. For Atunes, it’s recognition of farming heritage.